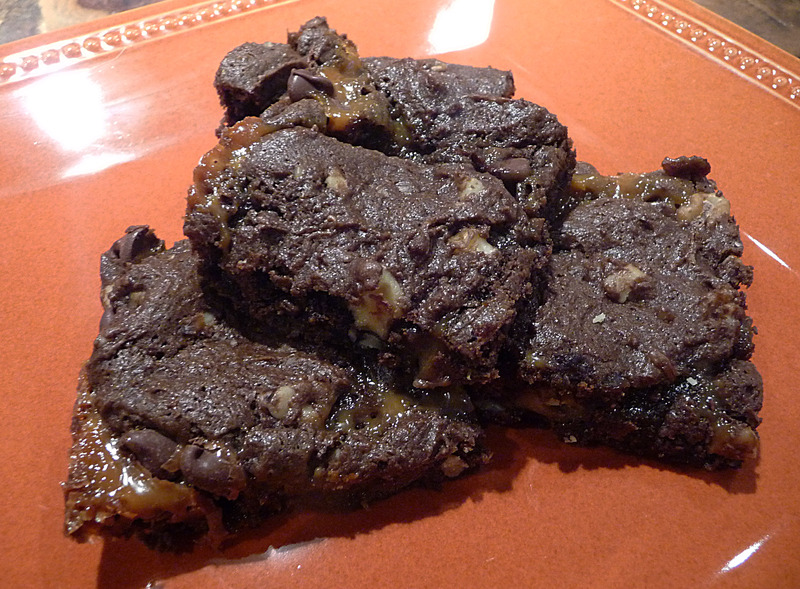 This recipe is long overdue making its debut on Betty’s Cook Nook. 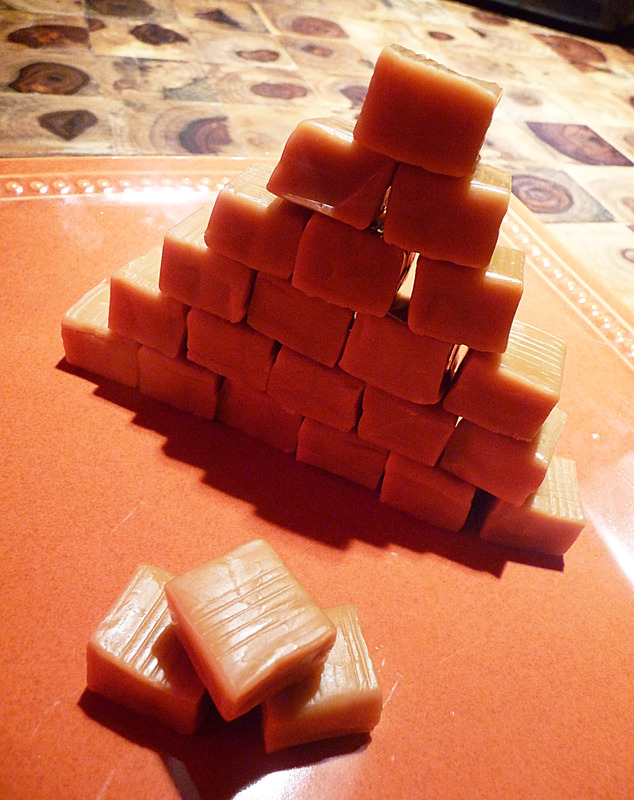 I was supposed to make this fudge during my big getaway to Italy in 2012-2013 but I wasn’t able to score all the ingredients while in Tuscany so the recipe sat here online without pictures or a story behind it … until now. 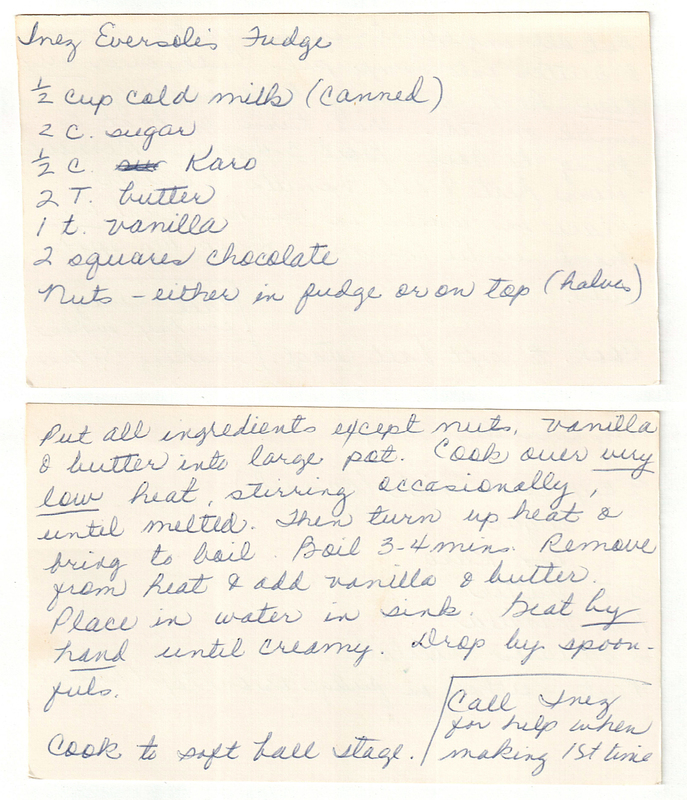 Out of all of my Mom’s recipes that I’ve been intimidated to make, I think it was this one takes 1st place because of the special note Mom included on the recipe: “Call Inez for help when making 1st time.” If Mom needed counsel the first time making this fudge, I was surely destined for a foodie fail – especially after my run-in with the red candy apple on a stick disaster from 2011. ❤ Eureka! 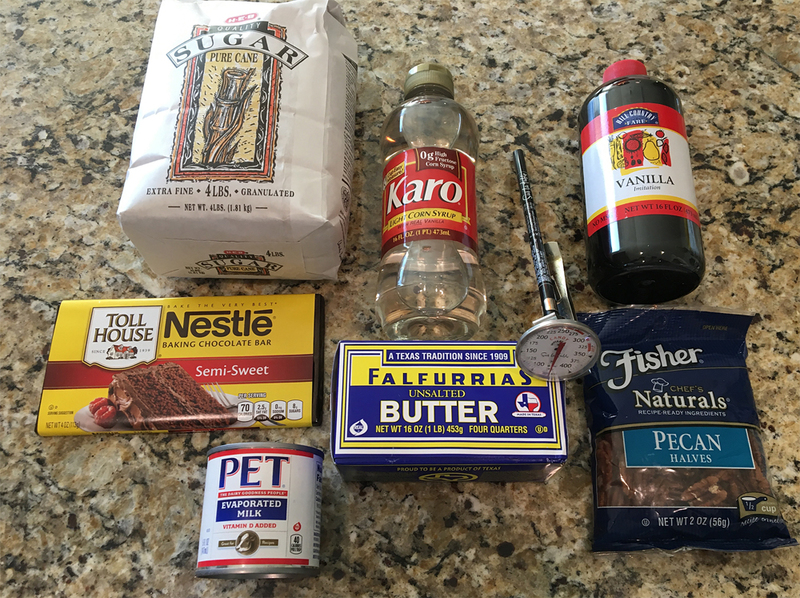 I learned something significant that you probably already know – the difference between condensed milk and evaporated milk! I always knew these as “milk in a can” but if you asked me the difference I would have said one is evaporated and one is not. Bad guess. It turns out that both milks have the majority of water removed from them but condensed milk is sweetened milk (a.k.a. 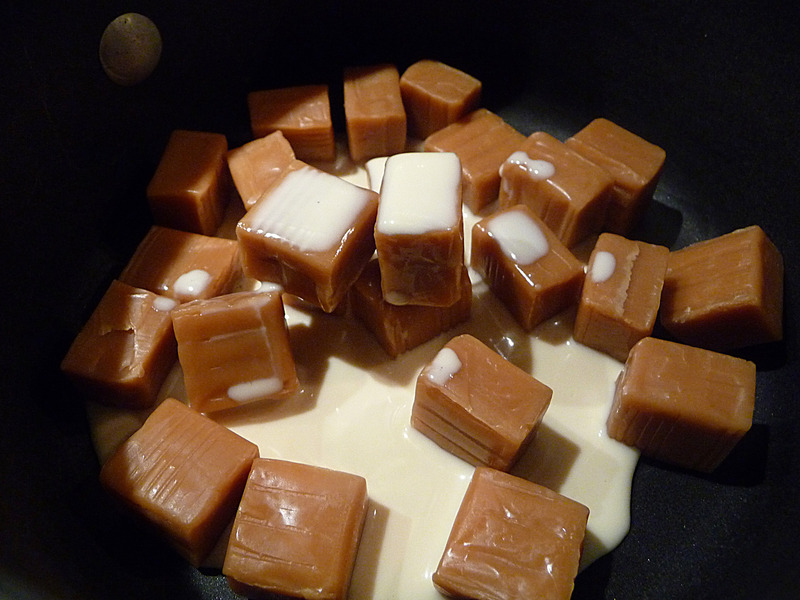 sweetened condensed milk or “SCM”) and evaporated milk is not. Since this recipe calls for sugar, I can create confidently knowing that “cold milk” (per the original recipe below) would have been shorthand for evaporated milk. My culinary cred just rose by +1! I’m not sure why the recipe calls for the milk to be cold only to heat it up in step one, but hey, don’t mess with instructions, right? ❤ Even though the recipe doesn’t call for it, I enlisted the aid of my candy thermometer to try and prevent another culinary wreck. Turns out I would need the aid of the entire Justice League to try and save this mess. I’m not sure what I made but I think it was a cross between a Texas praline, a chocolate crepe, and a brick (translation: FLAT and HARD). 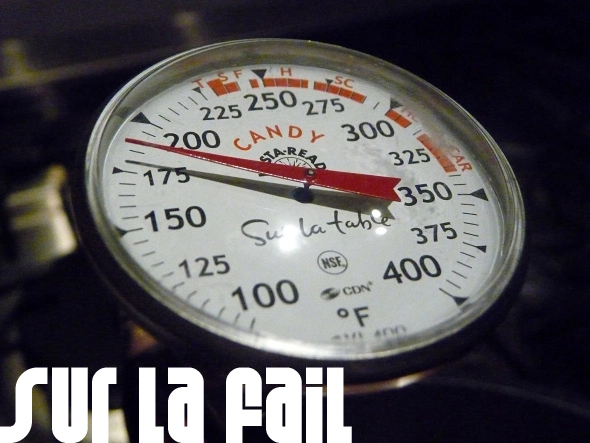 After two candy-coated foodie fails I think I’ll be trading in my Sur la Table candy thermometer for something more reliable. Maybe a digital candy thermometer! ❤ I distinctly remember Mom making this fudge at the holidays when divinity, rum balls and ribbon candy made special appearances. While we had the fudge with chopped nuts, Mom made the fudge with pecan halves on top most often so that’s the way I made them (hint hint). ❤ Here in Texas “nuts” is an abbreviation for Texas Pecans. Y’all can trust me on this! ❤ On the next “go” of this recipe I’m going to try it in a deep glass dish then cut it into squares. Seems like many of the modern day recipes call for that technique and maybe I’ll be luckier in the end. ❤ Fudge Lover? Get in line! 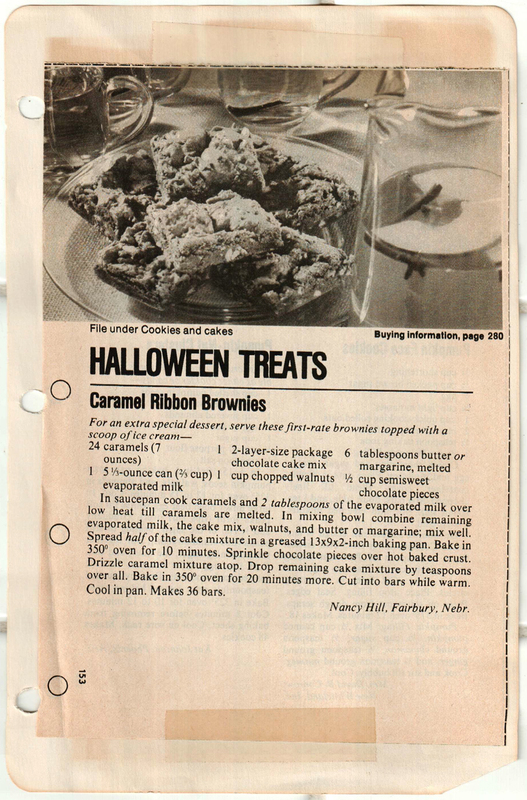 Here’s another fabulous fudgey find from Mom’s cookbook. 1. Put all of the ingredients (except the butter, vanilla and nuts) into a large pot. 2. Cook over very low heat, stirring occasionally, until melted. 3. Turn up the heat and bring to a boil, boiling for 3-4 minutes. Cook to the “soft ball” stage (about 235°F – 240°F). 4. Remove the mixture from heat and add the vanilla and butter. 5. Place the molten pot into a sink filled with water. Beat by hand until creamy. 6. Drop by spoonfuls (I think onto a glass or ceramic dish would work best). Top with your pecan halves (if using), let rest… then dig in! Enjoy! I grew up living in a house on a corner lot at 2927 Trailend in San Antonio. The house right behind us sat on a large piece of land that was one acre in size; ten houses were neighbors to a slice of this great space. The yard was meticulously beautiful with plush grass and large shade trees that made it look like a plantation dropped in the middle of San Antonio. Inez and Herb Eversole were a wonderful older couple who lived in a charming 1951 stone house that sat right in the middle of the tiny world all its own. I’d climb our fence and peer over it to see what was going on with our backdoor friends. Mrs. Eversole was always kind to me and I’d often visit to have a chat about the goings on at school and home. Mr. Eversole had a riding lawnmower that I thought was just about the neatest thing I had ever seen. Looking back I think Inez and Herb were our family’s adopted grandparents – not just because of their geo proximity – but because of their genuine awesomeness and willingness to help us out with time-tested tips and tasty dishes. 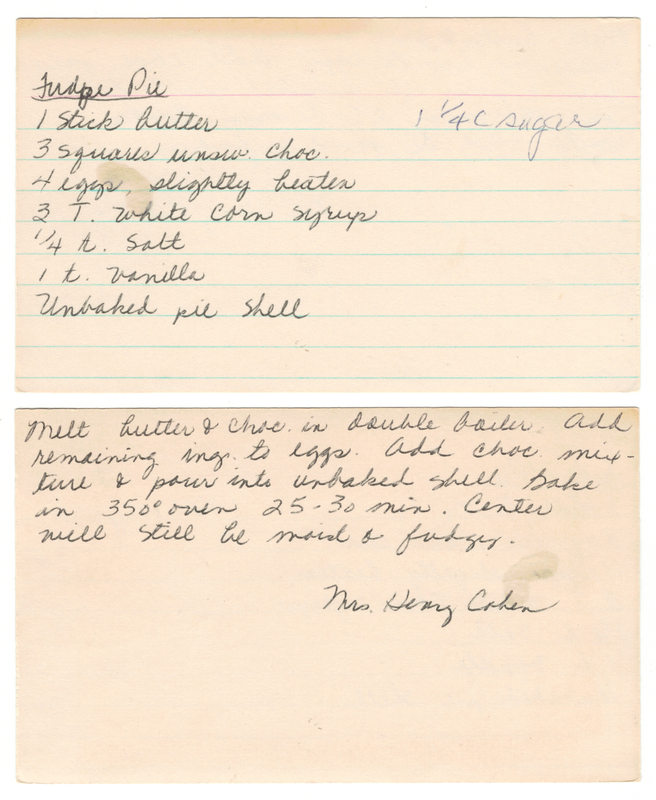 So there you have it – this is Inez’s very own fudge recipe! 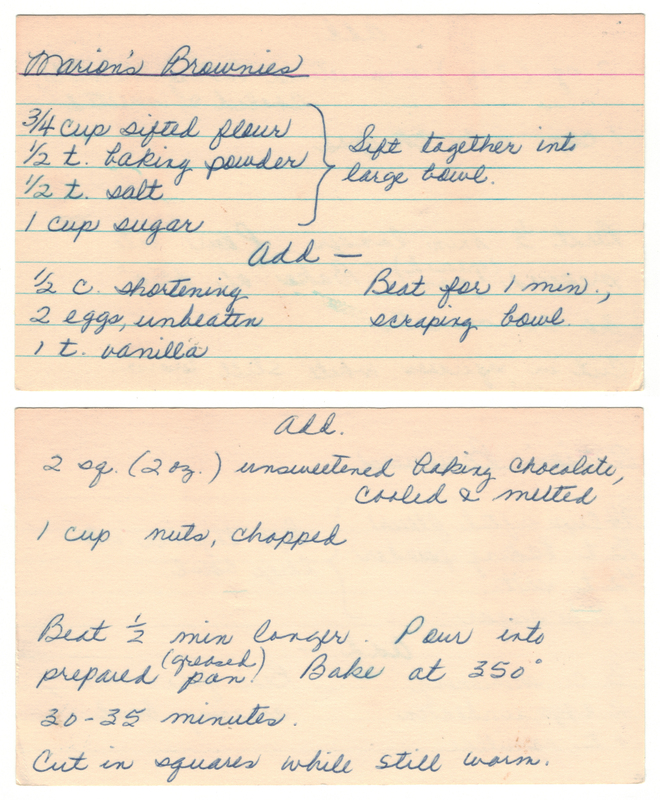 I have one or two other recipes from Herb and Inez in Mom’s cookbook and will gladly add them soon. 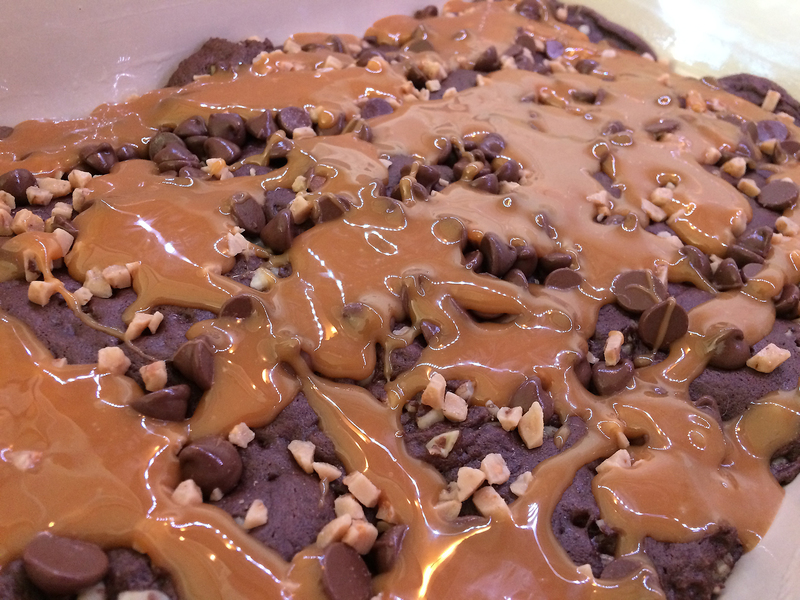 Cheers to you, Inez and Herb – Thanks for the sweet fudge recipe! And the great memories. Back in a time before baking on the quick, folks made things from scratch. Sure, it takes a little more time but you might just find that the food tastes better – especially since you’re in full control of what goes into your creation. And more importantly, what goes into your belly! ❤ Don’t forget to let the chocolate cool after melting. ❤ I like my brownies soft and chewy. 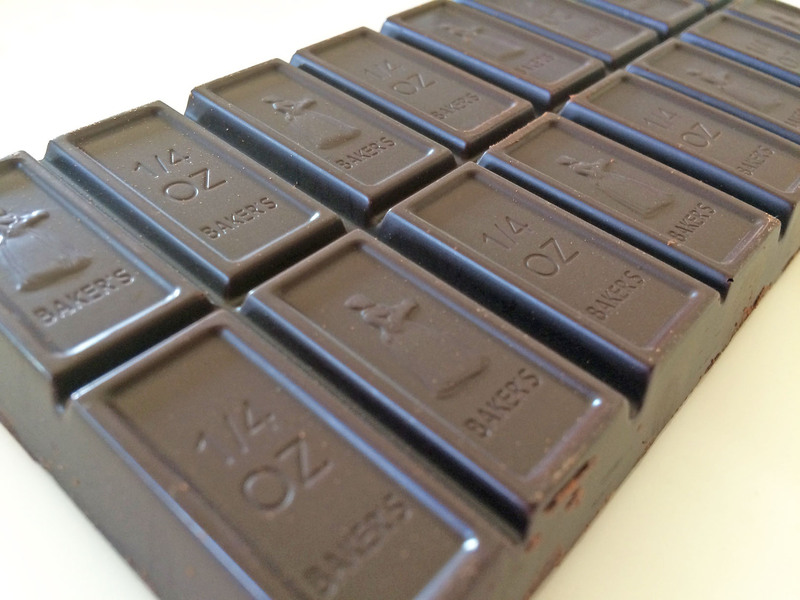 So if you’re making me a batch, you know what to do! ❤ A cold glass of milk or some ice cream is brownie’s BFF. Just sayin’. 1 cup | nuts. And in Texas “nuts” = pecans. 1. In a large bowl sift together the first 4 ingredients (flour, baking powder, salt and sugar). 2. Add the next 3 ingredients (the shortening, eggs, and vanilla). Beat for 1 minute, making sure to scrape the bowl to ensure a smooth blend. 3. Add the cooled and melted chocolate and the pecans. Beat for 30 seconds longer. 4. 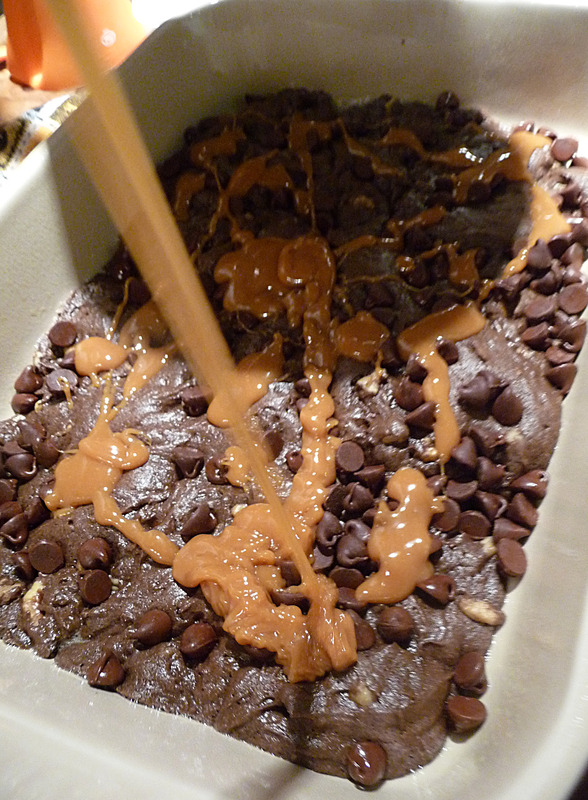 Pour the brownie mixture into a greased pan (about 8″ x 8″) and bake at 350°F for 30-35 minutes. 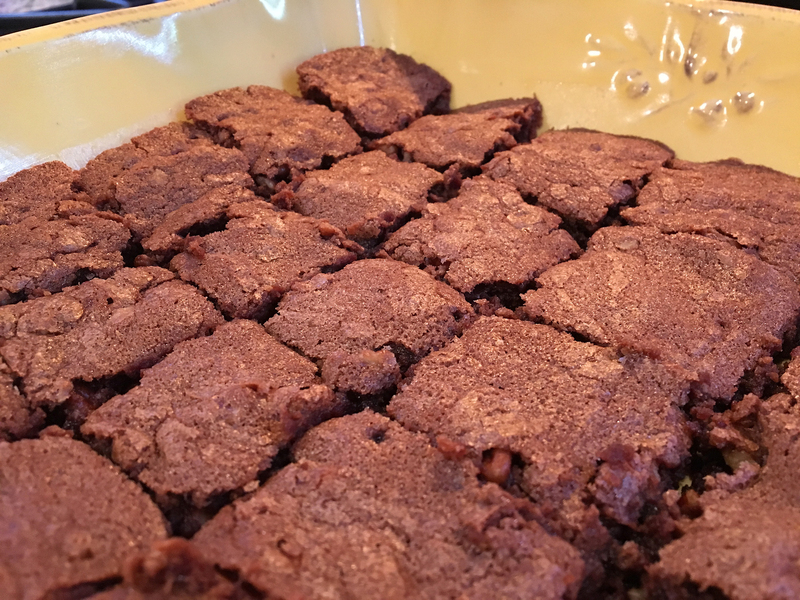 Cut brownies into squares while they are still warm. After checking-in with my brothers, Tim and Roger, Tim knew who Marion was. Her name was Marion Praino Sands and she was married to Bob Sands. I did some Googling and found recent obituaries for both. After reading a bit more into their lives I learned that they lived a few minutes from me where I lived in Dallas for 20 years! 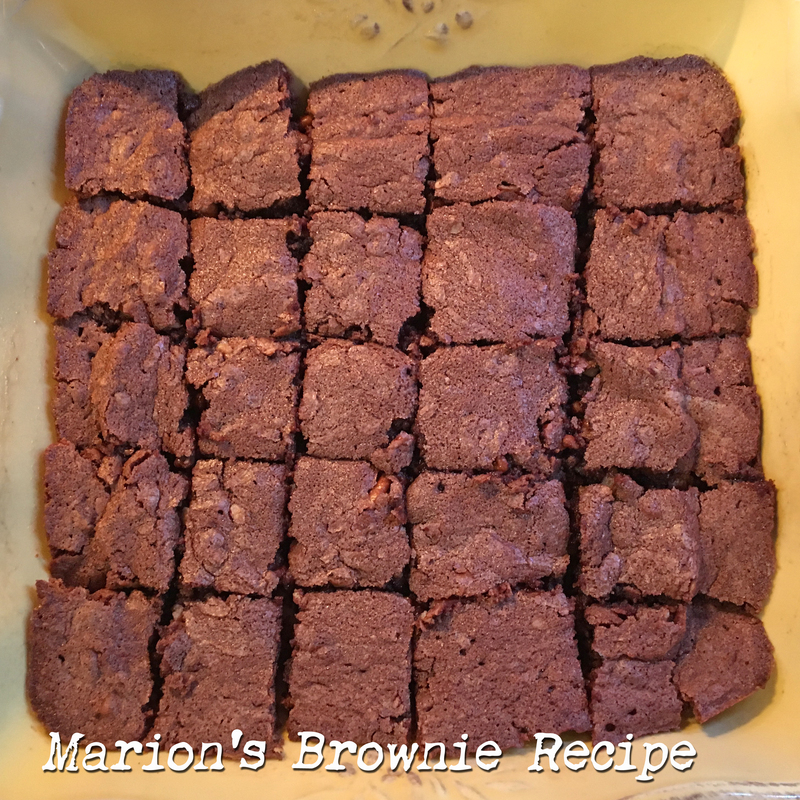 My heart sunk knowing that Marion’s brownie recipe was sitting in Mom’s cookbook within reach. And if I had researched this post a little sooner our paths may very well have crossed. My hunch is that Marion and Bob met my Mom and Dad when they lived in San Antonio. The connection didn’t end there – I learned that Marion was a member of St. Patrick’s Catholic Church in Dallas for over 50 years. And if memory serves correctly my Mom was a member of St. Patrick’s Catholic Church in San Antonio, where I was born… and I believe how I came into my name. When things go wrong I’m not quite sure why “oh, fudge” became synonymous with its less appropriate saying but to me “oh, fudge” is a great thing! ❤ In the 1970s we would likely have enjoyed whipped cream from the can. Thank you, Reddi-wip! These days I use my gourmet whipper that I scored at Williams-Sonoma – it really creates a great whip. When you make your own whipped topping you can flavor the creams but for this recipe we chose to go with the standard recipe. 1. 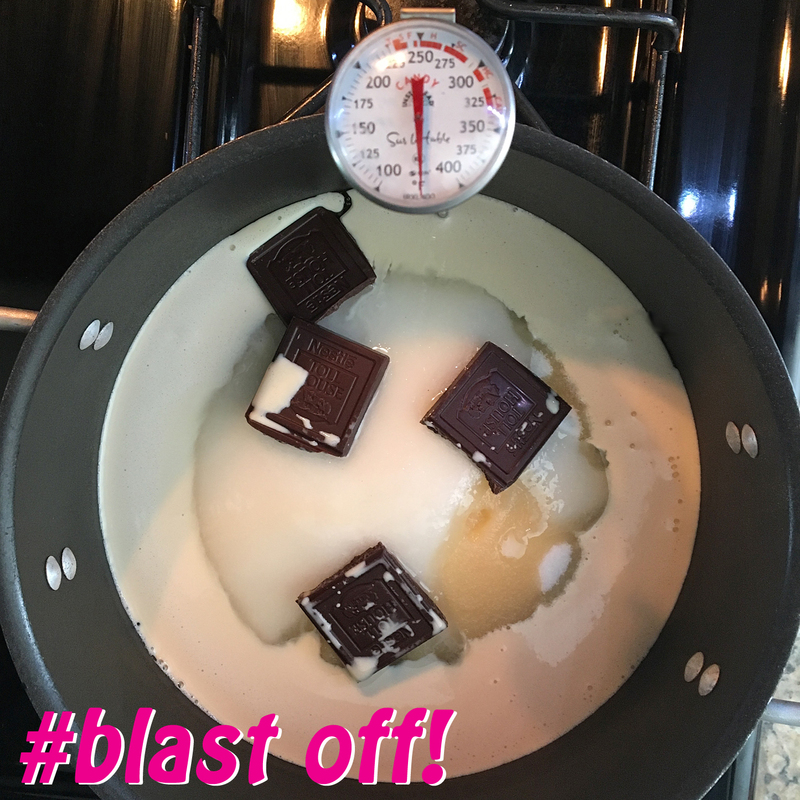 Melt butter and chocolate in a double boiler. 2. To the eggs add the corn syrup, salt, vanilla and sugar. 3. Temper the eggs by adding the chocolate mixture in thirds. Turn then pour into the unbaked pie shell. 4. Bake in preheated oven for 25-30 minutes (we cooked our pie for quite a bit longer – we were using our new gas oven). 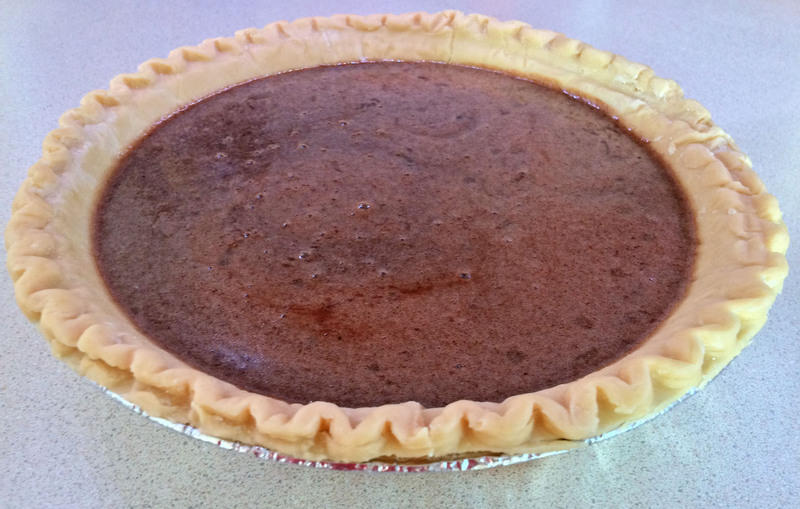 The pie’s center will be moist and fudgy. 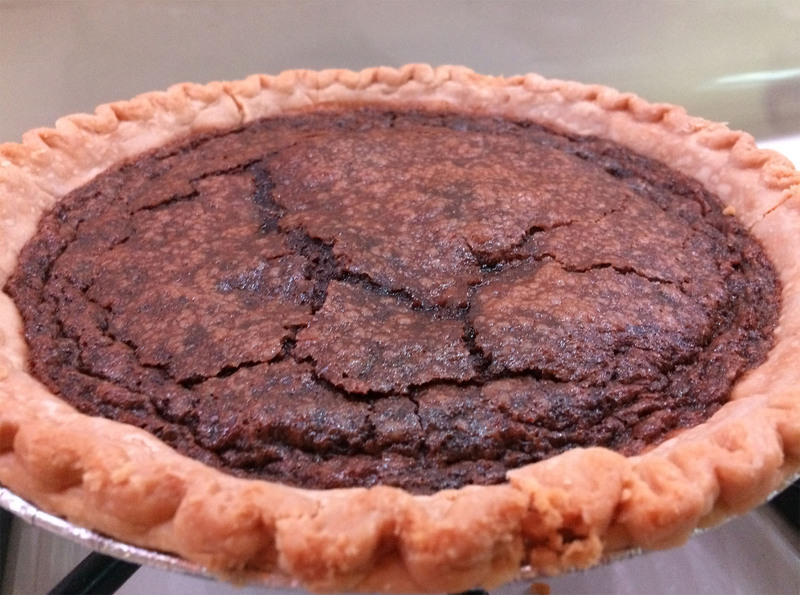 To serve: Let the fudge pie rest until cool. 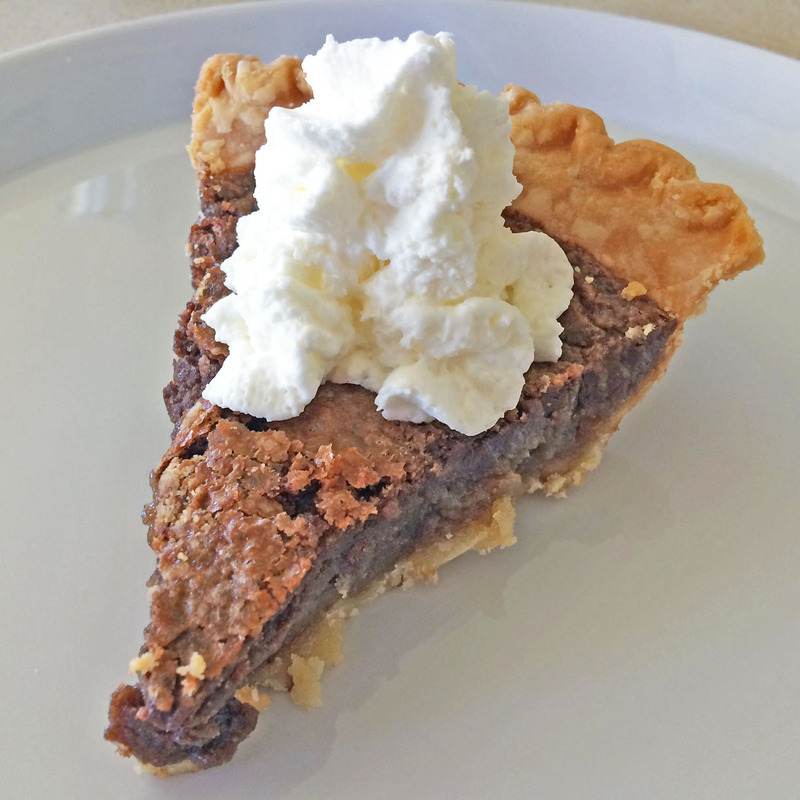 Slice and top with some fluffy whipped cream.